I popped into Walmart the other day, and was surprised to discover almost an entire aisle dedicated to wax melts. Wow! I knew they were popular, but I had no idea they were that popular. And here’s the thing: most of the wax melts they were selling were made out of paraffin wax and synthetic fragrances. Those aren’t things I want my family breathing. But I do like the idea of wax melts. So, I grabbed a cheapy electric warmer (less than $7), and I went home to make my own wax melts. 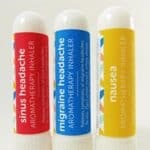 My version cleans the air instead of polluting it, and can easily be tweaked to help with sinus and cold/flu symptoms. Or just follow the printed instructions below. Melt your wax in a double boiler on the stove. There’s no need to get fancy here. 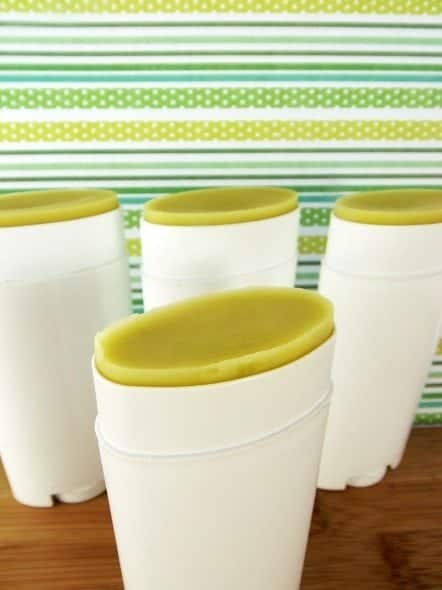 Just fill a pot with water, and stick another container inside of that one to hold your wax. You just don’t want to heat your wax over direct heat. It’s flammable stuff. I recommend melting your wax inside of something you don’t care about. 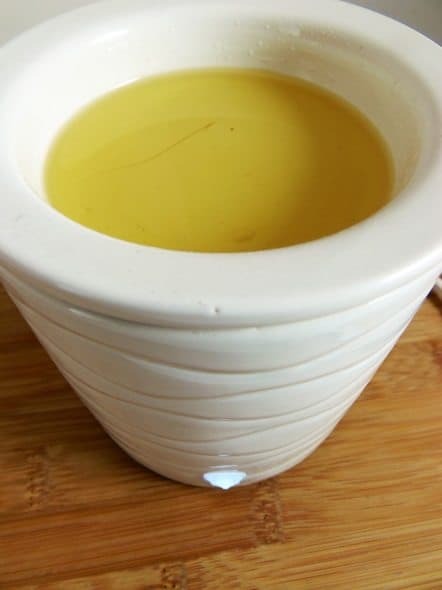 Consider picking up an old pot at a thrift store that you can use just for melting wax. Then, you won’t have to worry about cleaning it afterwards. If you think you’ll be melting wax often, you might want to purchase a second-hand crockpot for that purpose. 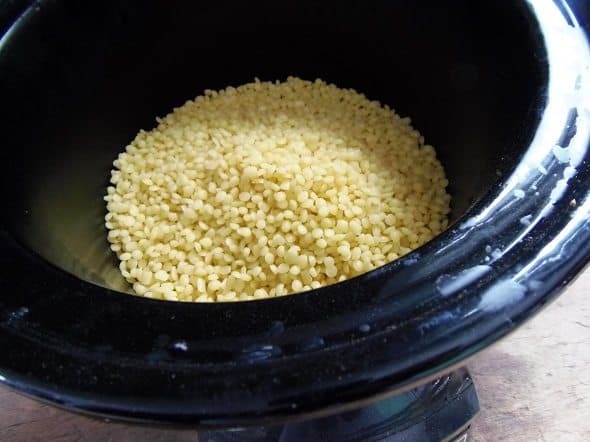 I recently started heating my wax in a crockpot, and I have to say there are a lot of advantages to doing it that way. I don’t have to babysit the wax while it melts, and I don’t have to worry about the wax cooling before I’m done working with it. As long as the crockpot is on, it stays melted. I’ve used a lot of different molds over the years, and I can tell you that silicon molds are my hands-down favorites. 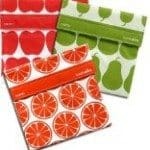 They’re super durable and easy to clean; and it’s really easy to release your projects from them. 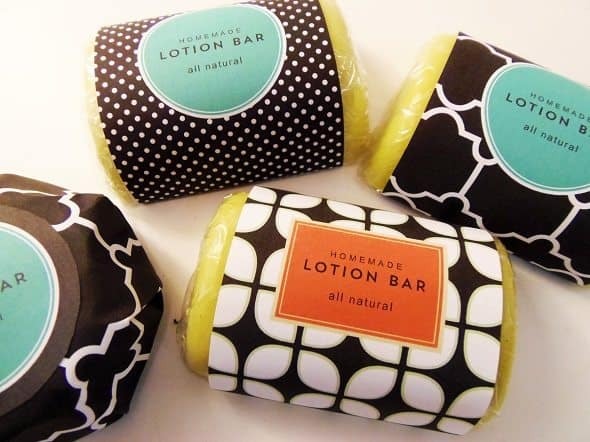 I use them to make all sorts of things, including my lotion bars and my dish detergent tabs. I keep an eye out for silicon pans/molds when I’m out thrift storing and yard saling. That’s where the ones I used for this project came from. Just look for something shallow. A candy mold would be ideal because it will keep your wax melts on the small side. You definitely don’t want your wax melts to overfill the top of your electric wax warmer. That would be messy. 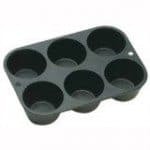 If you’re looking for something that will work, I recommend this peanut butter cup mold. It’s the one I use for my dishwasher tabs, and the size would be ideal for this project. 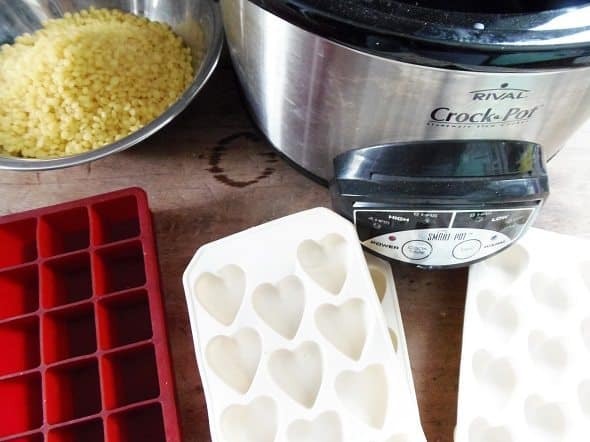 If you don’t want to spend any money on molds, an ice cube tray will work, or you can even reuse a store-bought wax melt package. 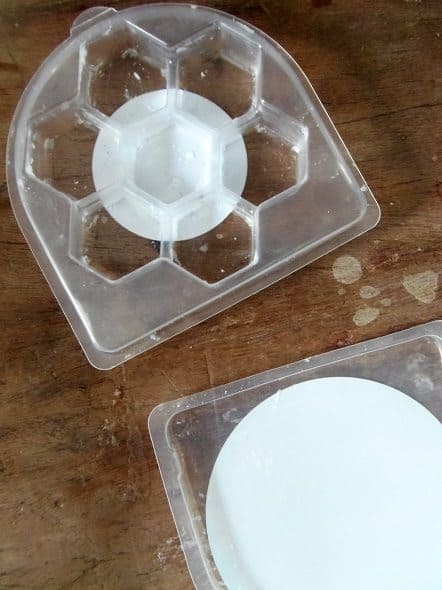 I picked up this pack of wax melts, to show you how to do that. Just wipe out the inside, after you use the last melt, and voila, you have your mold! All right, now that we’ve covered all the ins and outs of picking the right mold, let’s get back to making wax melts. Once your wax is fully melted, add essential oil to fragrance it. One ounce of oil per pound of wax is a good rule of thumb. You can use less than this, but don’t go over this amount. Then, pour your wax into your mold(s). 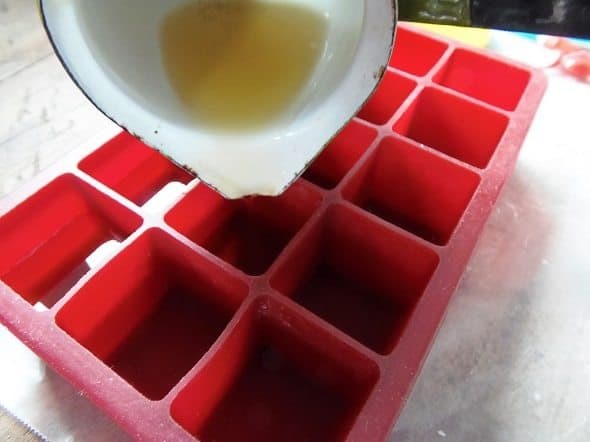 The square ice cube mold I used was kind of on the large size, so I only filled it half way. Here’s what the store-bought melt package looked like after I filled it with wax. And here’s what it looked like after the wax cooled. Better than new! and they’re ready to use. Paraffin wax and the synthetic fragrances found in most commercial wax melts are air pollutants, and contribute to poor indoor air quality. Beeswax actually improves indoor air quality. 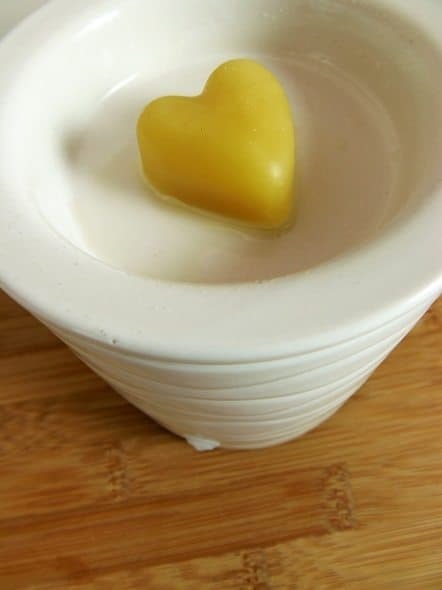 When beeswax is melted, it releases negative ions that clean the air. Those ions are capable of neutralizing both allergens and air-borne toxins. Pretty dang cool. Pair that with essential oils, and you have the perfect recipe for clean air. 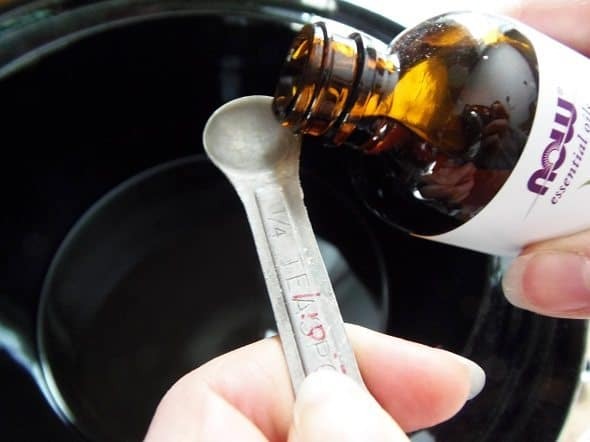 For years, I used essential oils to add fragrance to my various diy projects, completely missing all of the health benefits associated with the various oils. There are oils that help with congestion, oils that help with headaches, even oils that can kill germs. Now that I know better, I’m a lot more thoughtful about which oils I use in my projects. When I made this batch of wax melts, I used equal parts peppermint oil and eucalyptus oil because they’re good for the congestion associated with sinus headaches and colds/flus. That’s just the thing for this time of year. You could easily make wax melts for tension headaches, migraines and even destressing. That’s the beauty of making things yourself – you get to decide what goes into them. 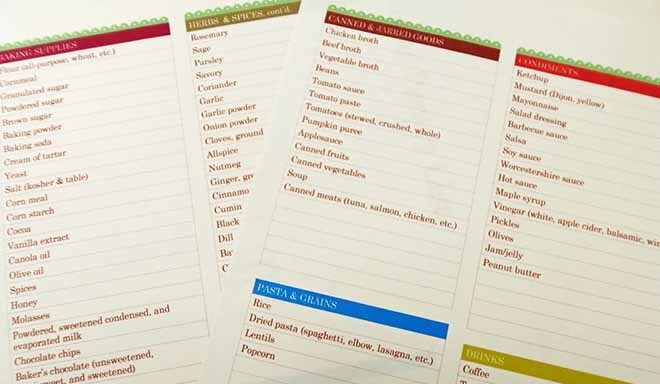 It has a section in the front where you can look up essential oils to use by ailment, and a section in the back where you can look up specific oils to see what they’re good for, and check for any warnings associated with them. 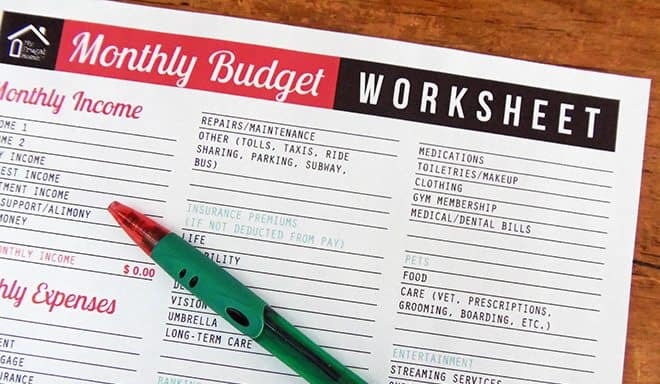 Such a good resource. I’ve only had it for a couple weeks, and I keep pulling it off the shelf. 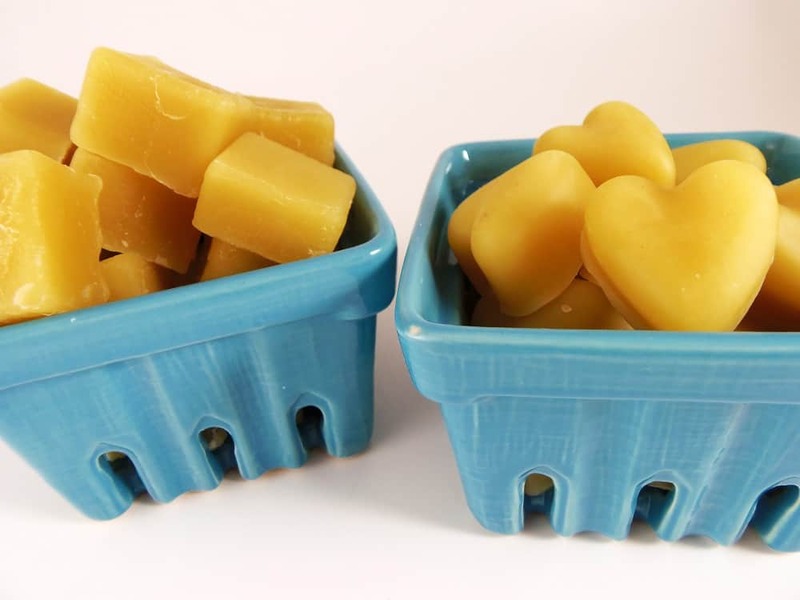 Want to try beeswax wax melts, without making them yourself? They’re available for purchase in my shop. Is there a certain brand of essential oils better than another or are ones sold at Walmart just as good? Hi Sally, I buy Now brand essential oils. 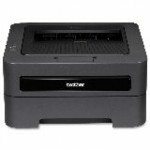 They’re always rated as being among the best, and they’re reasonably priced. 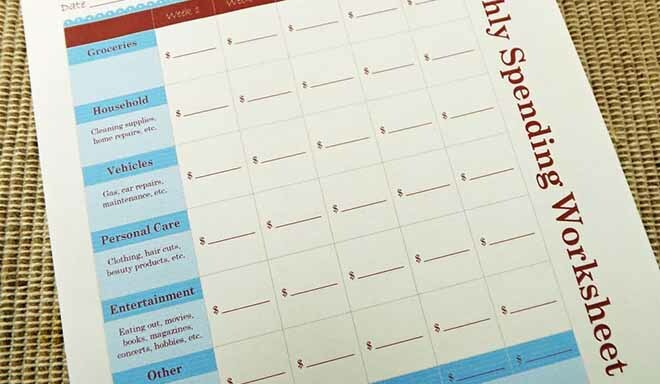 A lot of people swear by Young Living and doTerra, but with those brands, you’ll pay a lot more for a lot less. I saw someone else mention that Walmart sells essential oils, so I went to take a look a couple weeks ago, and I did indeed find oils on the candle aisle, but the packaging said “contains essential oils,” so I suspect you’re getting a little EO with a lot of filler oil. While cheaper, I don’t think you’d be getting pure oils. If you just want them for fragrance, that’s probably fine. If you’re hoping to get additional benefits from the oils (congestion relief, etc., you’re probably not going to be as happy with them. Hope that helps. That helps a ton! Thank you for your time! 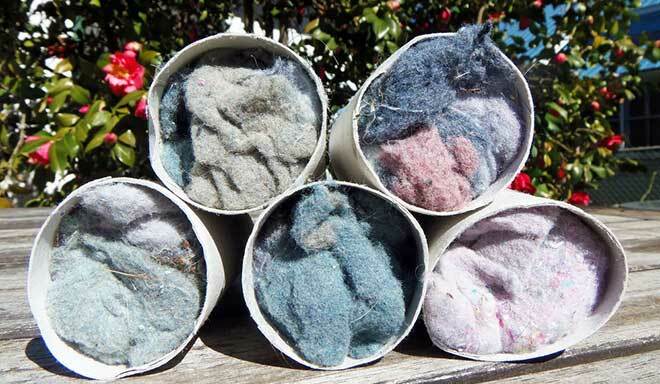 Once I find a good supply of beeswax I am definitely trying this. I go through lots of these. Could I just say that I use pure beeswax bars from my local hardware store (Dawson’s in the UK) for anything requiring beeswax these days? It’s 99p for a bar and a sharp knife makes it easy to cut up into shards, or you could grate it like soap. 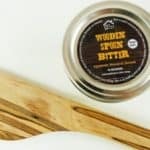 It’s dirt cheap, really easy to pick up, just beeswax, and I use it for lotion bars, hair wax, etc..
You can find them in the polishing or woodworking section and besides uses such as these, you can use the plain bar as hockey stick wax, or for polishing wood. 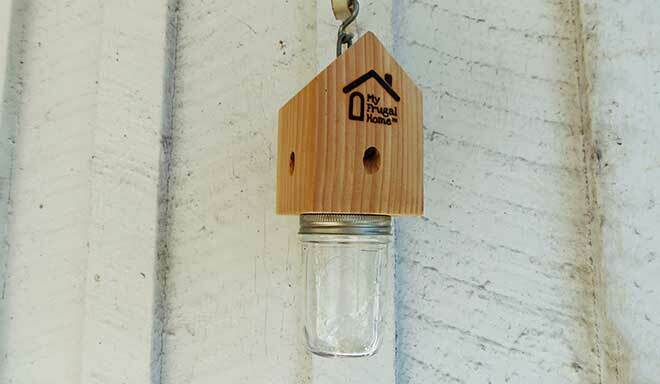 Do you happen to have a recipe for making a bug repellent scent to keep bugs from entering the house. 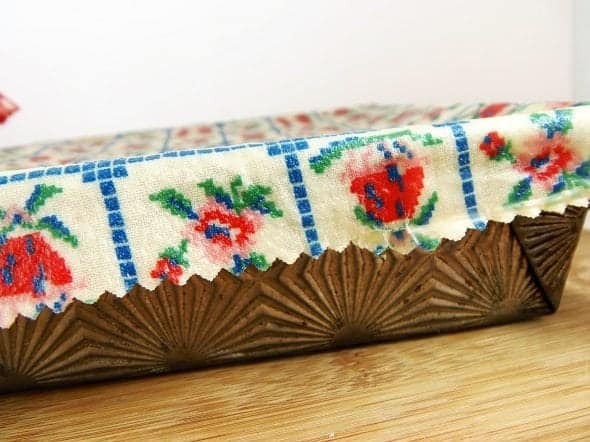 I have a wax cube warmer, just looking for the right recipe. Any help would be much appreciated!!! 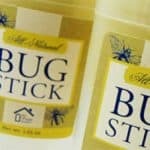 It’s a blend of lavender, citronella, lemongrass and other essential oils that bugs don’t like. I use it in all of the bug repellent products that I make. 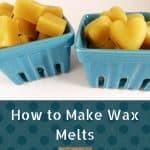 Just follow the wax melt recipe, and use that oil, and you should get great results. It smells nice, too. 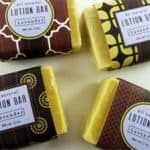 Can I reuse the beeswax after the scent is gone? 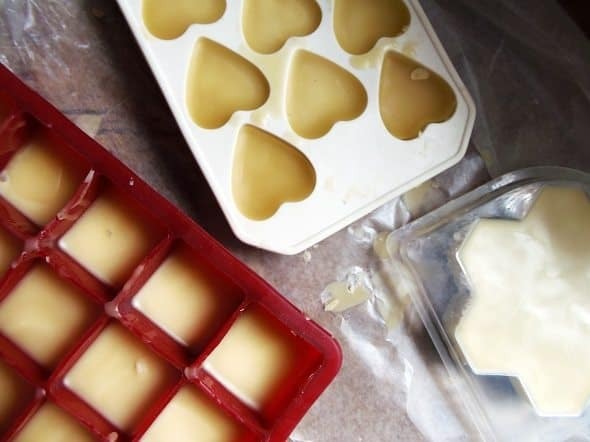 Yep, you can either continue to melt the beeswax in your warmer (the beeswax will continue to clean your air even after the scent is gone), or you could melt it back down, and make new wax melts (with more fragrance). 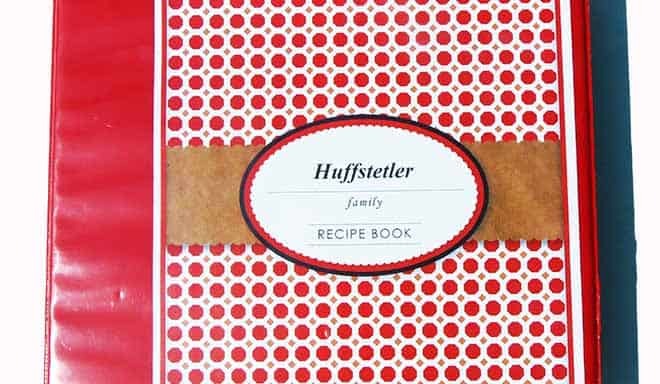 I’d recommend making a batch with just beeswax and essential oils. 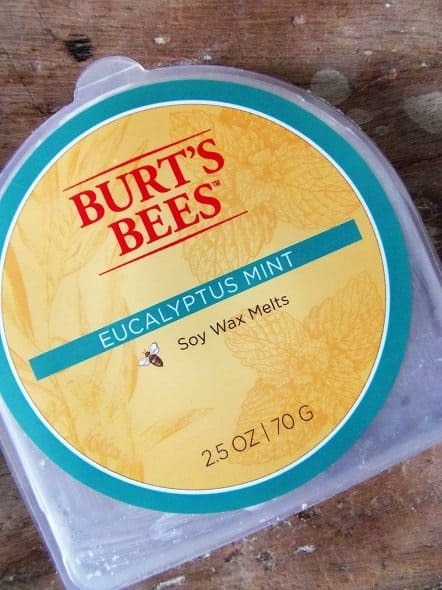 Coconut oil is often added to wax melts to lower the melt point of the wax, but that isn’t an issue with beeswax. If you find that they still don’t smell as strongly of your EOs as you’d like, you can do as much as an ounce per pound of wax. Hope that helps. 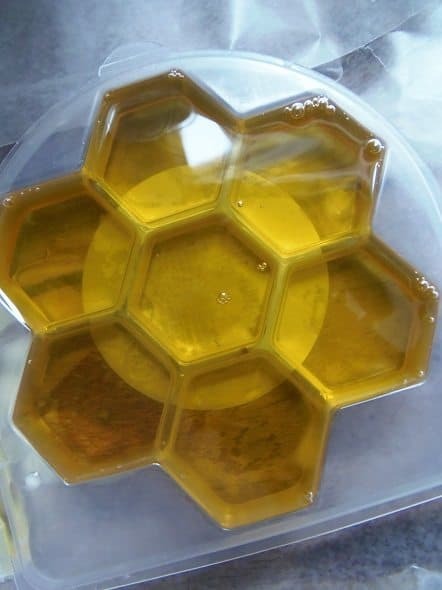 Hi, do you have any sites where you can find beeswax for cheap or any stores? Beeswax has a really high melt point, so that’s why it took so long to melt. If you try again, I would just add the coconut oil and beeswax and melt them at the same time. If your wax melts still come out oily that way, there’s probably too much coconut oil in that recipe you’re using. Some people add the coconut oil to lower the melt point of the finished wax melts. 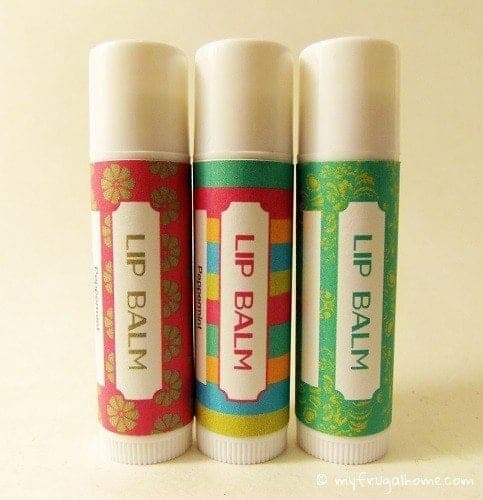 I prefer to make them with just beeswax (and essential oils). 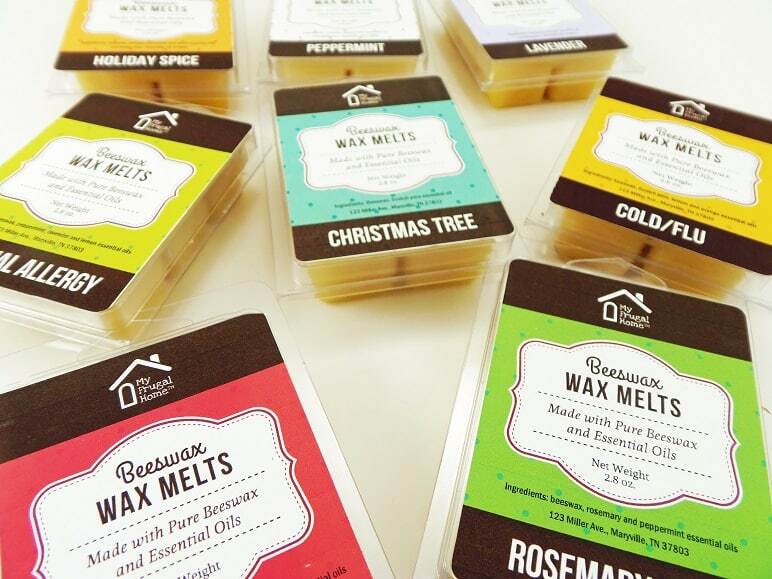 100% beeswax wax melts last a lot longer, and they clean the air. 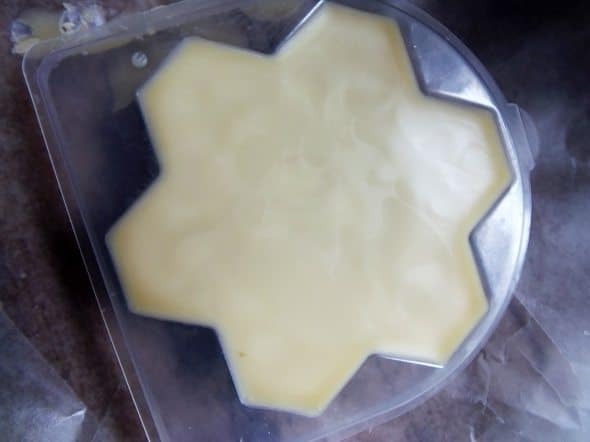 I would like to make some beeswax melts with myrrh essential oil. I haven’t been able to find any recipes for just the myrrh. Do you happen to know what amount of EO I should use. My family really likes the aroma of myrrh. 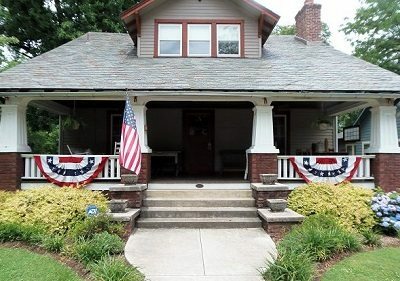 Thank you for all the great information in your post. I haven’t made any with myrrh, but I typically use 2 oz of oil for every lb of wax. So, that should work in this case, too.